Know exactly how much usable fuel you have on board. Simply insert gauge into each tank until it touches bottom. Place finger firmly over top opening and remove to read fuel quantity from the gauge. The Universal Fuel Gauge indicates usable gallons on a calibrated scale. 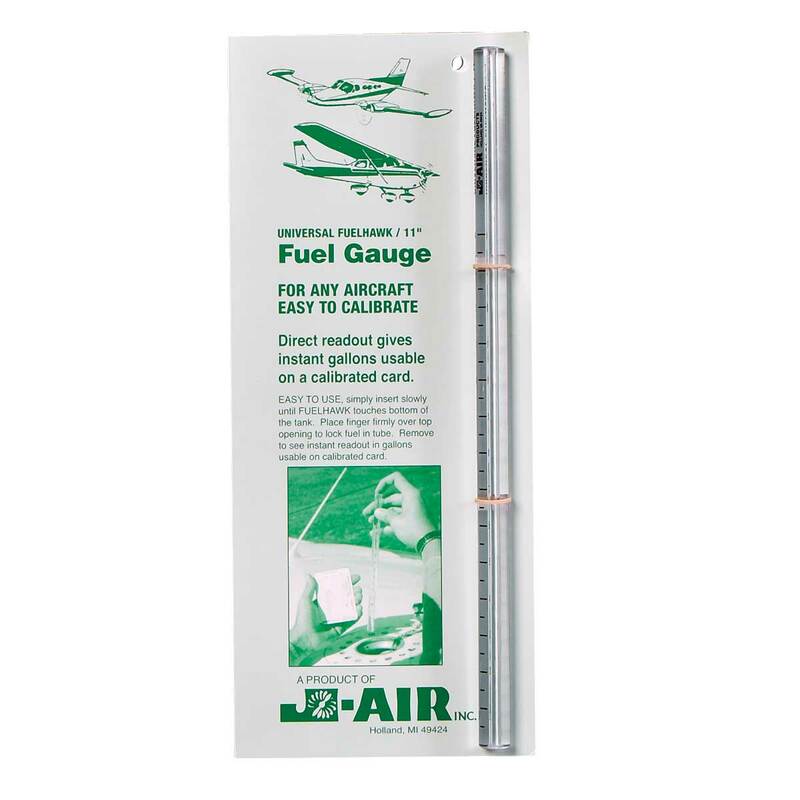 Simple instructions explain how to calibrate for any size tank or aircraft using a known quantity of fuel in your tank and the included calibration card. 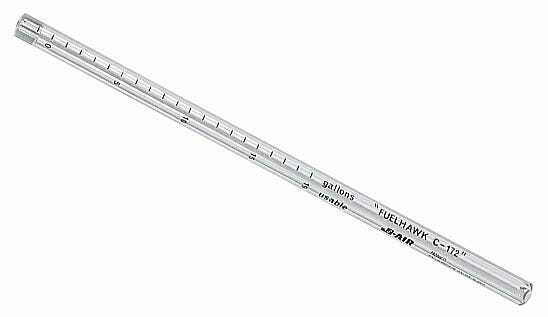 Instead of the metal gauge that came with the plane, or the wood gauge the previous owner made, this is a reliable, easy to use gauge that works easily and quickly. The original metal stick did not show any markings after dipping, so is useless except to make other gauges from it's scale. The homemade wood stick the previous owner made shows a wet line, but evaporates too quickly to read and being wood, could leave little chips or flicks of wood in the gas tank. I find this unit very sturdy and easily readable. I added yellow reflective tape to the top of the dip stick so I can quickly know which end is "up" and which end has the numbers, so I know which way to hold it quickly. 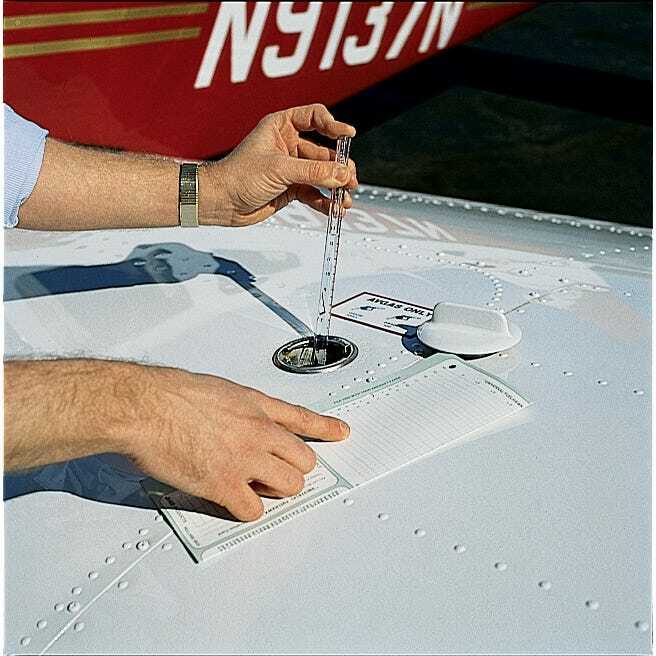 I recommend this product to cleanly and quickly read your fuel level in your wings. I have used the fuel gauge for over 20 years and have given several as gifts to friends. Our Fuel Level is LIFE and I never fire an engine without knowing EXACTLY how much I have on board. Dash fuel gauges are never trust worthy so the only way to know for sure is to use the Universal Fuel Gauge every time you fly. Great quality and well designed. Works well for most applications. I love this simple gauge. I always know exactly how much gas I have. When I first got the gauge I filled up my tank a few gallons at a time and used a sharpie to mark the gauge. It's cheap, it works - and frankly, it could save you from running out of fuel one day. Pros: Very easy to use and calibrate. GA fuel gauges are notoriously inaccurate, this makes weight and balance calculations, as well as endurance estimates much more accurate, and thus, safer. Cons: Include a reminder to lower the tube slowly into the tank. When you drop it right to the bottom, a pressure build-up from the bottom of the tank can cause an abnormally high reading. Pros: easy to use. no moving parts to break. Cons: can be difficult to use. I know people who have droped them hard and they chip and break. works well. Not as I expected. Since I rent it's kind of difficult to go through the process of using this gauge. I expected it to be marked accourding to different aircraft. But I do know now why that is not accurate. Pros: Exactly as described Universal guage works for my Piper Colt Calibration instructions very clear and sample graph provided that was easily copied for many future uses Cons: None really for this universal guage. I wish there was one specifically for the Colt PA-22-108 so I wouldn't have to mess with the calibration Excellent! Will this thing work on T206? BEST ANSWER: Yes, this will work on a T206. Is this long enough for Cessna 172 long range tank or should I go with XL one? I rent different model year 172 so I need universal one instead of the one only for the newest 172 with 53 gallons. BEST ANSWER: I fly PIper Warriors and the 11 inch works well for them. As long as the tube is long enough to reach the bottom of the tank you are flying and you set up a chart for that aircraft you should be good to go . I have a piper Cherokee so I don't know about the tanks your tanks. I'd recommend the xl though as the longer tube makes it easier to hold on a cold windy day. You don't want to drop it into the tank. I would not recomend this style, scale is different, and do not show in gallon, it was waste of money.. I got the XL version for a 182 with long range tanks. Works fine. Will this work for a Grumman Cheetah..?? BEST ANSWER: Yes, if the depth of the fuel tanks is not over 11".